As much as I kind of over the whole fey-are-the-new-vampires trope, I've loved the two previous Holly Blacks books I read so I knew I was going to pick this one up. And I'm really glad I did because I really liked this book and am excited to see where the story goes from here! I am back today with another book review, today it is The Cruel Prince by Holly Black. Thanks so much to Hachette Books for sending me a copy of this book for an honest review. As always, all opinions are my own. The story follows Jude, a girl whose parents were brutally murdered in front of her when she was just a little girl. The murderer, Madoc, happened to be a general to the High King of Faerie, and Jude's mother was once his wife, Jude's oldest sister his daughter. Jude and her sisters are taken to Faerie and raised by Madoc and his new wife. Many fey dislike mortals, perhaps no one more than Cardan, the youngest son of the High King. Jude is determined to prove herself as a fighter and will stop and nothing and no one to do so. First off, the concept of this story was really interesting, but not super original. I've read a few fey books and most of them involve hating humans. Where this story becomes more engaging is the development of palace intrigue. For better or for worse, there were times when I forgot this was a set in Faerie and just imagined a regular high fantasy with problems in the palace. Then there'd be some crazy magical thing happen and I'd remember what was really going on. Before I get too far into this book, I just want to talk about why I didn't give it a full star rating, even though I really enjoyed it and am so ready for the sequel. THE ROMANCE was my number one issue in this book. I don't think it was necessary for the story and I really don't like how it came to be. This might get a little spoilery, so look away now if you don't want to be (although, if you read the synopsis, you'll know who's involved). I really thought that we were past the elementary school trope of "I only bully you because I like you." Apparently not. 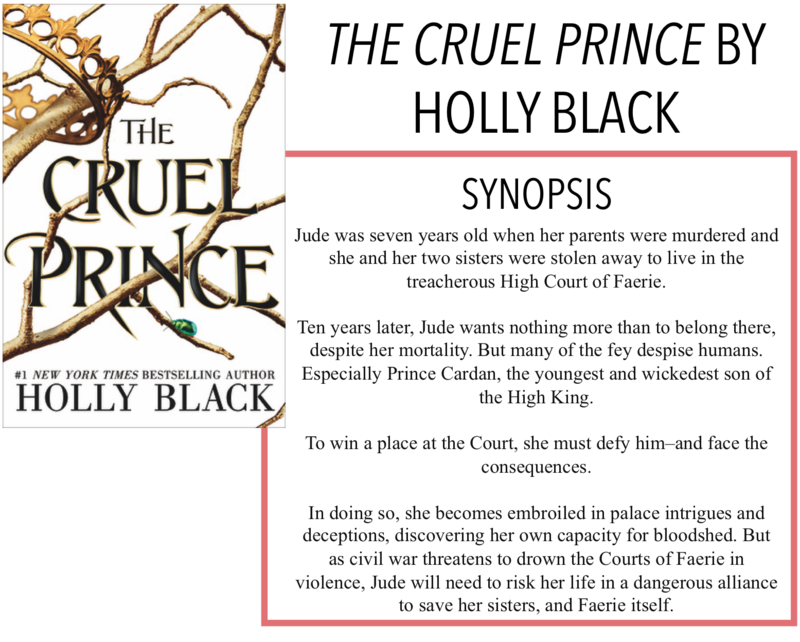 There is a reason this book is called The CRUEL Prince. He is absolutely horrid to her, bullying her, making fun of her, and letting others hurt her. This is not the basis for a relationship. You can be mad at yourself for liking someone, but don't be mad at them. And then, after we see how absolutely terrible he is to her, he's all "But I like you," and she goes for it! Perhaps I wouldn't have minded so much if he was kind of mean, but, up until this point, Black depicted him as a full-blown jerk. And then I'm supposed to just get on board with a romance, heck no! End of possibly spoilery section. Anyways, was not a fan of the romance. But the rest of the story was really good. I liked Jude a lot, she was strong and tough (although she didn't always make great decisions, see spoilery section). I wasn't the biggest fan of Taryn, her twin sister, but I don't think we saw her enough to make a decent judgment. Vivienne, the oldest was cool and I wanted to see more of her, hopefully in book two? Overall, the end of this book wrapped some things up, but I cannot wait for the next one!